Online purchases appear to be surging in the US and UK during Black Friday as more consumers shun standing in line. This has not stopped US stores reporting massive queues outside their shops, although in the UK there were smaller crowds than a year ago. 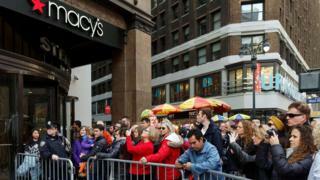 New York's giant Macy's store said thousands of people queued to get in. In the UK, consultants Experian and retail group IMRG said that online sales were on course to pass £1bn on a single day for the first time. Black Friday: Love it or hate it, but what is the theory behind it? Last year's Black Friday saw shoppers in the UK fighting over bargains, websites crashing and delivery companies struggling to cope. The discount day originated in the US, where it takes place the day after Thanksgiving, traditionally kick-starting the Christmas shopping period. In the US, some retailers started offering deals early and several stores have turned the event into a weekend of discounting. Macy's said about 15,000 shoppers waited outside its Manhattan department store in readiness for its opening on Thanksgiving evening. Amazon offered discounts in the lead up to the shopping event. The National Retail Federation, based in Washington, estimates that about 135.8 million Americans will shop during the four-day holiday compared with 133.7 million last year. The US shopping bonanza has spread, not only to the UK and other parts of Europe, but also countries such as Brazil and India. It is still dwarfed by China's Singles Day - the world's biggest online shopping event. On that day earlier this month, Chinese e-commerce giant Alibaba reported sales worth 91.2bn yuan ($14.3bn; £9.4bn), a 60% increase from last year. In the UK, retailers are expecting Black Friday to be the biggest shopping day of the year. Visa Europe said £1.9bn could be spent online and in-store on its cards alone. There were some queues for early opening, but early data suggests there was more interest in internet sales. The BBC's Adam Kirtley, at Debenhams' flagship store on Oxford Street in London, said: "The doors opened at 8am and there was a very orderly trickle of people coming in to bargain hunt. No queues, no hassle." However, Debenhams still expects 10 times the footfall in the Oxford Street store compared with an average Friday, he said. Some discounts were posted on retailers' websites from midnight and online sales in the first hour of the day were more than double last year, according to data from PCA Predict. Retail analyst Nick Bubb said: "It looks as if Black Friday spending has been more spread out this year and more weighted to online, but every indication is that the combined event will be bigger than last year overall. "It is too soon to say whether the retail sector will be any better off in net terms once the dust settles." It could not have been more different from last year. At Currys in Brentford this morning, there were fewer than two dozen shoppers queuing for bargains. The manager told me more folk were ordering online and picking up in store later. Overall, Black Friday seems a bit more subdued. It is clear retailers have learnt the lessons from last year. Security has been beefed up. Tesco's in-store deals, for instance, have been very tightly managed to avoid a repeat of last year's chaos. A number of retailers have been running Black Friday deals for the last few days to try to avoid a massive peak in orders today. But it will still be a huge, probably a record breaking day for sales. The question is, is this the peak for Black Friday in the UK? Last year was the first time retailers really embraced this US tradition and, for many, it simply distorted Christmas spending instead of delivering bumper profits. Some retailers in the UK decided not to take part in the event this year. Supermarket chain Asda, which started Black Friday promotions in the UK in 2013, was among them. Asda did, however, announce a three-day fuel price cut taking its unleaded petrol price to 99.7p per litre. David Blair, of global brand consultancy Fitch, said the fact Asda had pulled out of Black Friday in the UK suggested its US parent company, WalMart, did not think Black Friday had a future in the UK. Some analysts feel the event has distorted Christmas spending, pulling it forward at a time when retailers traditionally charged full prices. James Miller, senior retail consultant at Experian Marketing Services, said: "There is little doubt Black Friday has dramatically changed the way people shop in the run-up to Christmas and has created an expectation of deep discounts that arguably did not exist before." A report by LCP Consulting suggests almost a third of retailers in the UK and US think Black Friday is "unprofitable and unsustainable". There have also been some signs of a backlash against the relentless marketing drive from retailers. One online campaign entitled Buy Nothing Friday suggests that, instead of shopping, people should "go for a walk and enjoy the crisp autumn breeze". Meanwhile, the Booksellers' Association is encouraging independent book shops to run "Civilised Saturday". Video Black Friday: What is it and what is the point of it?